When three thieves – an orphan, a ghoul, and a cursed man – are betrayed by the master of the thieves guild, their quest for revenge uncovers dark truths about their city and exposes a dangerous conspiracy, the seeds of which were sown long before they were born. Cari is a drifter whose past and future are darker than she can know. Thanks to Hachette Audio, Libro.fm, the author, and narrator for a listening copy of The Gutter Prayer (The Black Iron Legacy #1) in exchange for an honest review. Receiving this LC did not influence my thoughts or opinions on the novel. First off, I love John Banks’ narration. He has been the narrator for all of the books so far in Josiah Bancroft’s The Books of Babel series, as well as the first two (2) books of Jon Hollins’ The Dragon Lords series (among tons of others including Ian Esslemont’s Novels of the Malazan Empire). He is absolutely superb and I put him as one of my top 3 narrators of all time. He perfectly fits voices to suite the characters, puts emphasis where it is needed, and his pacing is exquisite. Now, onto the book itself. This is Gareth Hanrahan’s fantasy debut and, as such, will more than likely garner quite a few award nominations around the book community. And for good reason: it is pretty bloody-damn original and wholly impressive. The Gutter Prayer, for the most part, does not read like a debut should, but then again, I look at the publisher and I can see why. Orbit has been putting out some of THE best fantasy novels for the past couple of years and has yet to even tap the brakes. I began my blogging “career” at the perfect time and have been enjoying some of the best reading years I could’ve ever imagined. Hanrahan drew me in almost immediately with the first chapter. I love how your vantage point is that of a tower and the goings on within. The POV of an inanimate object is quite entertaining and IMO needs to happen more-often as I’ve only seen it one other time (in RBJ’s Foundryside.) But what really kept me going was the world-building. There is an astonishing amount of it going on throughout the novel, from the tallowmen and crawling ones, to the city of Guerdon and its underlying civilization; but while it is amazing, it also sometimes gets in its own way, especially in regard to some of the characters. Don’t get me wrong, I love having so much detail that you feel immersed into the city itself, but it cannot get in the way of me connecting with the protagonists. While I can pitter-patter around and be nitpicky, Hanrahan has written a fantastic novel that checks off the boxes of what I enjoy in a fantasy novel. Not only that, but he ends it with a perfect hook to keep me wanting more. 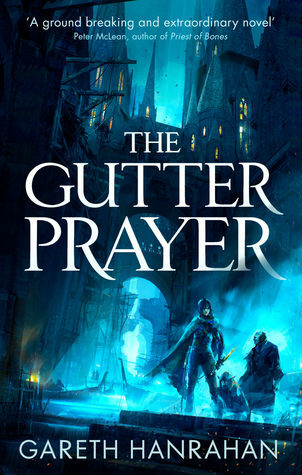 The Gutter Prayer is unlike any fantasy story you have read before and feels like the beginning of something ground-breaking. Hanrahan may have just created a new sub-genre of fantasy and I cannot wait to see what he has in store next. For sure! Very different from anything I’ve read but overall fantastic!